This 8" Plush Unicorn is the perfect addition to your collection of stuffed animals! Looking for a gift for a friend or family member? Make this unicorn their own by choosing or creating your own personal design on this soft and cuddly unicorn. WARNING: CHOKING HAZARD. Some plush have small, sewn on parts. Not for children under 3 yrs. Everyone loves to hear the words I LOVE YOU! 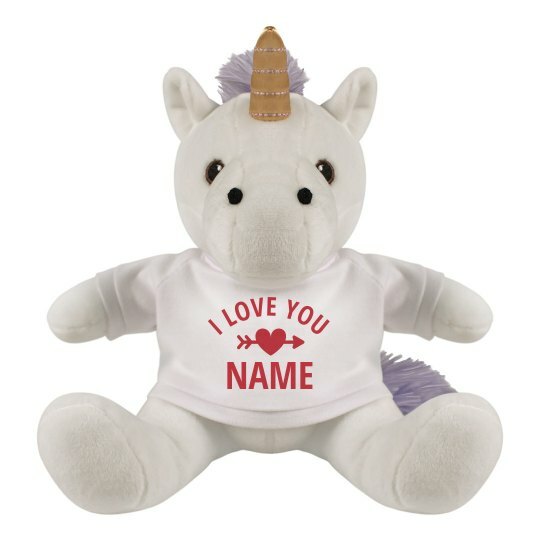 What more if you put her name on it on this super adorable unicorn plushie! This is best for a surprise gift on Valentine's Day and make her fall for you even more! Go and feel free to personalize it on our Design Center now!